Originally posted in this download topic at the Hullabaloo. This is the lot segment only. No custom content included. If you happen to have the same custom content installed that I did when I built this lot, it will show up. Otherwise it won't. Almost a century before the American Revolution, long before John Adams met Abigail Smith, a rugged individual by the name of Bill Wallace ventured far into the wilderness and built a one-room small stone cottage out in the wild on the edge of a beautiful lake. With nothing more than an axe, a pick, two oxen, a mule, and a lot of sweat, Bill cleared the land and established the first farm in what eventually would become the town of Bonnyview Shores. Partially furnished and landscaped. All the tricky bits are done. 3x5 lot. There was no television back then. No movie theaters. No radio. No neighbors. Not even a church. Just a dirt path that lead to through the mountain passes to a tiny market at Happy Valley. Bill and his wife Constance entertained each other with long discussions of philosphy, worrying about the increasingly hostile stone-age tribes that roamed the area, and most of all, the important business of making babies. As the children grew, they added on to the house. He built a foundation complete with a root cellar next to the original cottage. With the help of his sons he added a second story with fachwork walls. Every evening the family would gather by the fire and Constance would read a few passages from the Good Book, just enough to get a good conversation started. The kids grew up and Bill passed on to glory. Abigail stayed on for a few more years until she, too, passed quietly one evening while her great-grandson Scott read to her from The Song of Solomon. A few years later, a call came out from General Washington for all able-bodied men to assemble for the defense of Boston. Scott and his brothers Willem and Samuel hadn't had much truck with the British but they reckoned that if those wise old men in Philadelphia said this was important to the land, they were not ones to argue the point. They answered that call and made the long, long journey to the Altantic coast. Scott was there when the lobster backs were driven from Boston Harbor. The war dragged on. They lost Willem at Concord and Samuel succombed to smallpox while garrisoned near Philadelphia. Finally, once the British had given up and relinquished their claim to the land, Scott returned home. He found that the farm had suffered the war's deprivations. Much of the land had gone fallow and only a third of the livestock were still around. Nevertheless, determined to rebuild the farm to its former greatness, Scott labored there the rest of his days, spending his evenings with his family and his nights in the happy process of making babies. Generations passed and the village of Bonnyview Shores grew. When Sam Houston faced down Santa Ana at San Jacinto, the Wallace boys were there. When the call came from Jefferson Davis, there was a row in the family. Some of the boys wanted to fight for Southron independence; after all, fighting for freedom from oppression was a great family tradition. Others, though, favored the policies of Mr. Lincoln and agreed with his philosophy that the union his family had fought for must endure. Terrible years followed and most of the Wallace boys never returned home. Some lost their lives in the war, but most found other avenues for life in the increasingly industrialized east. The fledgling United States Navy sailing out of Norfolk attracted the wanderlust of still others. The farm went to range land and the cattle men came. Ownership of the land that old Bill Wallace had cleared passed into the hands of Miss Henrietta Wallace, who married a fellow named really nice cattleman named Clyde Franks. And thus, the old Wallace homestead passed into the hands of the Franks family. It was almost forgotten for several generations, just a dusty file in the back of the file cabinet, until one day a young lady by the name of Ophelia Nigmos Franks ran across the deed while she was organizing her husband's files. Ophelia noticed that the deed indicated that they owned some land on what become Buchanan Drive in Bonnyview Shores, right across from the incredible new Graviton Research Facility. She and her husband Tommy had often spoken of wanting to see that most peculiar place, and inspecting their long-forgotten property seemed like a perfect excuse to make the trip. Once she saw the spread, Ophelia was entraced by its charm. In her minds eye she could see the long furrows that had once been a great family farm. The old cottage was still there, overgrown with weeds and dry rot in much of the wood, but the stone foundation was as sturdy as ever. All it needed was a little tender loving care and a lot of elbow grease. So Ophelia fixed the place up so that it could be a little retreat for Tommy and her. She loves to swim, and when the weather is warm she spends more time in her bikini than any other clothing. She indulged herself and built a huge swimming pool complete with an island where Bobby could barbecue while she toasted her hide in the sun. With no better ideas in mind, Ophelia called her little cottage Stonewood, simply because it was surrounded by woods and built of stone. Now, enterprising Tommy saw the potential of the farm land. Within three weeks, the fields that had taken generations of Wallaces to build were back under cultivation and even the first year, Ophelia's Stonewood retreat was paying its own way on the family balance sheet. Last edited by Greg : 06-17-2008 at 11:58 PM. Amusement: Other than the above, I have never written a story set at Stonewood. To this day, it remains a favorite vacation spot of the Franks family, often frequented by strange flying people who don't seem quite so out of place in the most peculiar community of Bonnyview Shores. For some odd reason, they are quite hostile toward papparazzi. Last edited by Greg : 06-17-2008 at 05:18 PM. Magnificent! I enjoyed the story, too! I never said it before but this is one of my favorite houses Greg. It's one of my favorites, too, but oddly, I have never really played it. It has possibilities, though! Did you build it just for the story about it or did the story come after you built it? 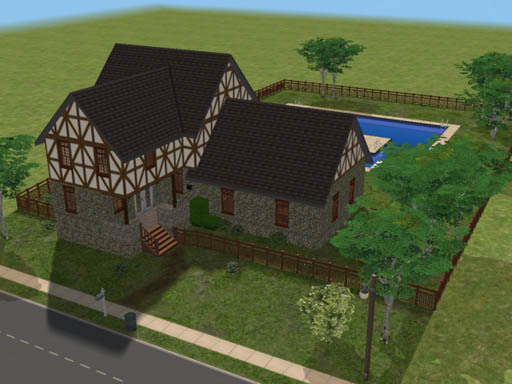 It started as an experiment with building a split-level house. As I built it, the tale grew in my mind, and then of course once I started to write it, it grew again in the telling. Wowwww. Inspiring. It's just that i'm sooo dissapointed cuz they don't have any old timey clothing. Those cc creators, contact me if you can create some. The only thing I can find is that pirate suit in CAS. There are some sites that specialize in period clothing. My brain is a bit frazzled at the moment so I can't think of any, but I'll bet if you ask over in the Help section, Rose will know where several of there are. Thanks, Rose! I knew you'd know! You can google for Sussi So Good also... she's got some cute petticoat and bloomer undies. I think I got mine from MTS2.